It is important to know that there are two types of track. the older coated steel rail, and the more modern, nickel silver rail. According to Hornby the nickel silver rail only requires to be "infrequently wiped over with a soft cloth". This is due to the rails resistance to oxidation. The steel rail however requires regular cleaning, with a "scotch" pad (according to Hornby). The three methods listed below have been proven for both types of track. This is the best method for removing stubborn dirt or to give your layout a spring clean after a long time not in use. It can be time consuming, but the result of a clean track is good running, which everyone can agree is a good thing. The track cleaning car like the Hornby example below are only really any good maintaining a clean track. This means they need to be run regular. 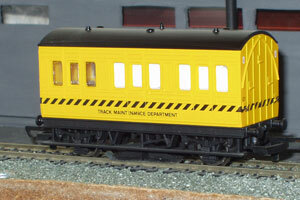 This Hornby model has a very fitting maintenance livery which gives it true purpose for running. Probably best to make up a maintenance train which on occasion you bring out and run. The coach that has been used (4 wheel Coach) is fictional and was never built in reality. This may put off some modellers that are looking for accuracy above anything else. 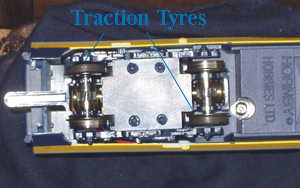 This model works by rubbing two abrasive pads which are spring loaded under the car along the track. It is meant to be pushed rather than pulled along but I find this leads to derailment at any minor imperfection in the track. Best to pull it behind a shunter (or any other powerful loco). This sounds great. If it works which I am assured it does, this should mean no more cleaning by hand. This is on my list of purchases. If anyone already owns one please review it in the forum. If you do not feel comfortable with carrying out any maintenance, there are many local model shops that will do this for you for not much money. Again the methods below have worked for me. They may not be suitable for every situation. Read the maintenance instructions that come with your loco. 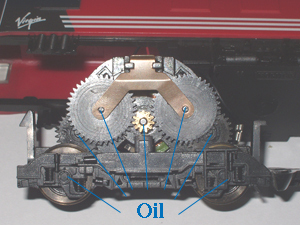 Hornby recommend lubrication every 100 running hours or every 6 months. I use the simpler method of applying oil when ever the train seems to be noisier than normal. This should be done with a light machine oil like 3 in 1. You must be careful when lubricating not to get any on to the body as this can deteriorate the condition of the polystyrene plastic that they are made out of. Application steps: Pour some of the oil in to the top of a bottle lid (or anything suitable). With a small screwdriver apply the smallest amount of the oil to any moving parts. If you can see oil than you probably have used to much. Wipe off any excess if you have added to much. Avoid getting the oil on the wheels as this will result in a loss of traction and will be transferred to the track. Wipe off any excess. Gears: Check that all the gears still have all their teeth. 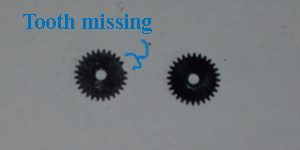 I have a class 90 that has lost only 1 tooth on one of its gears (See below). this has resulted in a intermittent loss in traction in one of the two sets of powered wheels. Symptoms of this problem are lack of traction and an increase in noise. Replacements have been brought and fitted. Wheels: As you well know the power for the locomotives motor comes from the track up through the wheels. Because of this it is very important to keep the wheels clean. In my experience good performance is 90% clean loco wheels and 10% clean track. There are many solutions to this, but the one I like the best is as follows. Turn the loco upside down being sure to support it. Connect your controller to the un-powered wheels (the ones which pick up power but don't move). Then power up the controller so the wheels are going round and then with a track rubber polish the dirt of the wheels. This will only work with the powered wheels, but it does a good job. With the un-powered wheels use the track rubber again, rubbing off the dirt. A damp cloth (Very dry!) is also very good, although its important not to get any water in to the electrics. Hornby recommend a "scotch" washing up pad on stubborn dirt. Tyres: Check that the locos traction tyres are all still in good condition. If you managed to get oil on the traction tires it is best to change them, giving the wheels a good clean before putting on the new ones. Bad traction tyres result in poor traction. In some circumstances the tyre can become too lose to grip the wheel so check that you can't move the tyre around the wheel. If you can replace them. 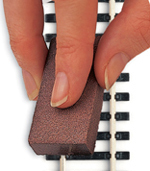 Carbon brushes: Occasionally the carbon brushes will wear out and will need to be replaced. Every motor and manufacture has their own motor designs so it is best to find the service sheet for your individual loco before you do this. If you do find it there are a few things I feel I should emphasize. First, the springs that pushes the brush against the commutator are under tension. When you remove the plate covering them they are likely to fly off never to be seen again if you are not careful, and second the brushes only go in one way, make sure that the flat end goes in first. Commutator: The commutator is the slotted copper segments at the end of the armature on an electric motor, which transfers the current from the brushes to the coils wound on the armature (definition courtesy of Hornby). This is best cleaned with a cotton-bud, making sure none of the cotton enters the motor. Clean off any black deposits which have accumulated from the wearing away of the brushes and from dirt that entered the motor. In some locos this is possible without opening up the motor. 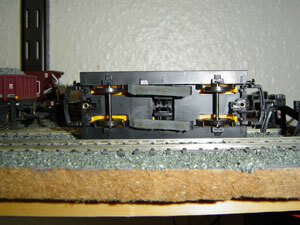 On Hornby "Ringfield" motors there is a gap to insert the cotton-bud. By rotating the gears you can access all of the commutator without opening it. 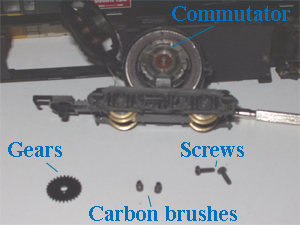 When servicing my Lima models (illustrated below) I found it easier to open the motor to clean the commutator.